If you want to become a better shooter, you must measure your both your current skill level and your progress. You can measure and track accuracy results, and depending on your personal goals, that may be enough. For recreational shooting and some types of competition, time may not matter. 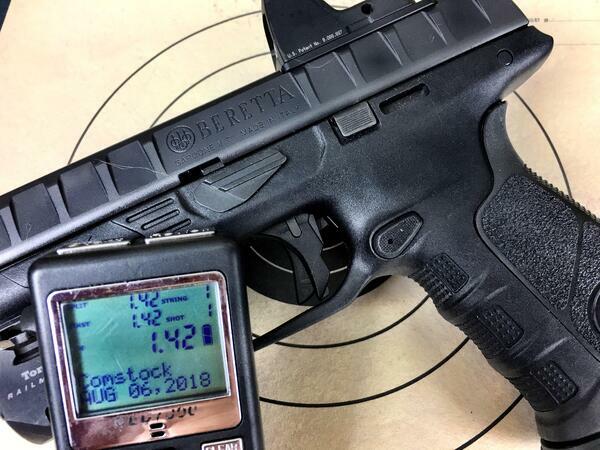 However, if you want to improve your defensive shooting capabilities or perhaps move up the action pistol sports ladder, being able to shoot accurately under time pressure becomes important. A simple shot timer is a great addition to your range kit. Here’s what you need to know about how they work. Comstock timing is the most common function of shot timers. The timer provides a starting beep and then listens for gunshots. Every time it hears one, it records and saves the elapsed time since the starting beep. The easiest way to explain Comstock mode is with a simple example. Suppose after the beep, you take one second to fire a shot. The timer records that 1.00 second time. When you fire again at 1.50 seconds, the timer records that too. Now it knows you’ve fired two shots in 1.50 seconds. It can also report back on your split time. That’s the time difference between one shot and the next. In this example, the split time was 0.50 seconds since you fired the first shot at 1.0 seconds and the next one at 1.50 seconds. Split times reflect how quickly you can get back on target and execute an accurate follow-up shot. Make sense? That’s the basic operation. Depending on the timer model, it might save dozens of shots so you can scroll through to analyze your performance. Timers also can save multiple shot strings so you can review multiple runs through a sequence. One more detail. Most good timershave flexible starting beep configurations. You can set the timer to begin a certain number of seconds after you hit the start button. That allows you to use one when alone as it provides a pause for you to get situated to start your routine. You can also have the timer start after a random number of seconds after you hit the start button. That’s great for training as you can’t game the clock and start your activity in anticipation. You have to react when the timer tells you to. Par time functionality provides a user-definable time limit to perform a task. You configure the timer much like you would a kitchen timer. Set it up for a certain number of seconds, and when time is up, you hear a beep. The difference between shot timers and kitchen timers is that you can set partimes down to hundredths of a second on most models. Par timer use is good for training at home. Unless you want to fire live ammo at your sofa to activate the Comstock timing mode that listens for gunshots, you must take a different approach. Without noise, the timer can't determine when you're finished. Using partime, you can set your timer with the goal you want to meet. The timer will provide a starting beep, and after the elapsed time, an ending beep. It’s up to you to make sure you’re finished before you hear that second beep. For example, if you want to work on your draws from concealment, you might set a partime of two seconds. If your gun is on target and ready to go before you hear the final beep, you’ve succeeded. As your skills improve, you can reduce your time to 1.75 or 1.50 seconds. The beauty of training with partime is that it’s infinitely flexible. You can use it for draw practice, magazine change practice, getting multiple shots on target in a given time, and whatever else you can dream up. You can always use a stopwatch to train, but that often requires a buddy, and leaves out a critical benefit of shot timers. They “listen” for the report of a gunshot, so they can keep track of exact elapsed time between the starting event and the time when you fire the shot. No guessing or estimating; you’ll know to the hundredth of a second how long it takes to complete a drill. You can find smartphone shot timers in Android and iTunes app stores, and they can work, depending on range conditions. The problem is that these software solutions are limitedby the existing microphone and speaker technology in the phone. Phonesare designedfor conversation level sound, not 150 decibels of blast. You also might run into sensitivity issues and confusion when other shooters are nearby. You can also invest in a dedicated, purpose-built timer. Companies like Competitive Edge Dynamics, Pact, and Competition Electronics make models specifically designed for range use. Not only are the start buzzers and microphones designed for range noise levels, the software that makes them run is chock full of features specific to shooting competitions and practice drills. In round numbers, one will cost you about $125 but is money well spent if you intend to purposefully developyour shooting skills. Next time, we’ll talk about how using a timer can make you a better shooter.